Rotary Club of Fleetwood - Welcome! Click HERE to find us and HERE to check the weather! Fleetwood is located in North West Lancashire, at the mouth of the River Wyre, on the southern shore of Morecambe Bay, the second largest bay in the United Kingdom. 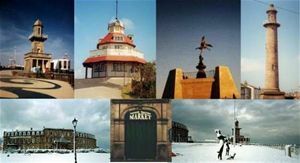 The town was founded in the early 1830s by Sir Peter Hesketh-Fleetwood, and designed in part by the Victorian architect, Decimus Burton. The old part of Fleetwood is centred around the Mount, the last in a line of sand hills, with the streets radiating outwards, reminiscent of a spider's web. The town has experienced many ups and downs throughout its existence, especially devastating has been the grievous loss of most of its fishing fleet following the Icelandic Cod Wars in the 1970s and the cutbacks in fishing quotas during the 1980s and 1990s. Fleetwood is renown worldwide for its tram system. In 1885 it was the first tramway to be electrified in Great Britain, and until recently, Fleetwood was the only UK town where trams ran along the main street.